MELBOURNE, Australia, August 8, 2016 (ENS) – U.S. and Australian officials have signed a new agreement aimed at strengthening collaboration on key transportation priorities in technology and innovation between the two countries. 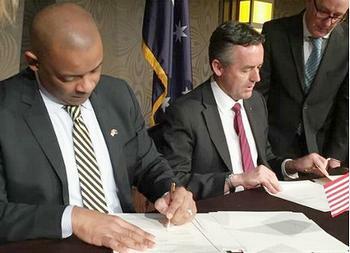 U.S. Transportation Secretary Anthony Foxx and Australian Minister of Transport and Infrastructure Darren Chester signed the agreement during the visit of Secretary Foxx to Australia on August 3. The Memorandum of Cooperation will enable the two nations to exchange information, data and best practices on the use of public-private partnerships (P3s) to support infrastructure development, intelligent transportation systems and unmanned aircraft systems. “We are already seeing the results of this cooperation, said Chester. The two officials discussed the use of public-private partnerships to deliver major projects, leveraging private sector investment in infrastructure and best practice in project development, as well as the use of intelligent transport systems in congested cities. One of the key areas of cooperation identified in the new agreement is the development of P3s to advance critical infrastructure projects. Australia employs P3s to support infrastructure projects, allowing smaller government investments to leverage much larger amounts of private capital to support the construction of roads, bridges and transit systems. Secretary Foxx met with Australian transportation officials at the federal and state levels, as well as private sector leaders, to learn more about Australia’s experience with P3s and to identify strategies that could foster the growth of successful P3s in the United States. Foxx used his visit to highlight the Department of Transportation’s new Build America Bureau. The Bureau serves as a one-stop shop for government and private sector entities looking for innovative ways, including P3s, to fund infrastructure projects. More information about the Build America Bureau is available at: https://www.transportation.gov/buildamerica. Chief Executive of the National Transport Commission Paul Retter said there is little point waiting for transport problems to occur before taking action. “Australia is undergoing rapid technological, social and economic changes which will result in the biggest transformations to our transport system since the invention of the motor car,” Retter said.